Doing Youth Participatory Action Research offers an unprecedented, in-depth exploration of the pragmatics and possibilities of youth-driven research. Drawing upon multiple years of experience engaging youth in rigorous, critical inquiry about the conditions impacting their lives, the authors examine how YPAR encourages the educational community to re-imagine the capabilities of young people and the purposes of teaching, learning, and research itself. Much more than a "how-to" guide for those interested in creating their own YPAR projects, this book draws upon the voices of students and educators, as well as the multiple historical traditions of critical research, to describe how youth inquiry transforms each step of the traditional research process. From identifying research questions to collecting data and disseminating findings, each chapter details how YPAR revolutionizes traditional conceptions of who produces knowledge, how it is produced, and for what purposes. The book weaves together research, policy, and practice to offer YPAR as a practice with the power to challenge entrenched social and educational inequalities, empower critically aware youth, and revolutionize pedagogy in classrooms and communities. 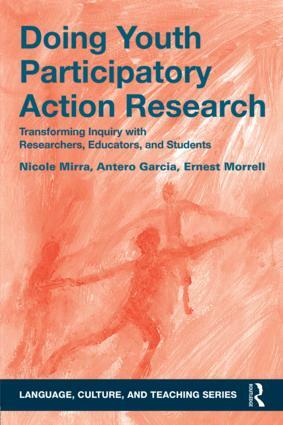 For researchers, educators, community members, and youth who want to connect, question, and transform the world collectively, Doing Youth Participatory Action Research is a rich source of both pragmatic methodological guidance and inspiration. Nicole Mirra is an Assistant Professor of English Education at the University of Texas at El Paso, USA. Antero Garcia is an Assistant Professor in the English Department at Colorado State University, USA. Ernest Morrell is Director of the Institute for Urban and Minority Education and Professor of English Education at Teachers College, Columbia University, USA and 2015 National Council of Teachers of English President.